Hello! Sparkle Creations Rubber Stamps is sponsoring Card Patterns this week, so I thought I'd play along! For more details and to see some sketch inspiration by their designers, please check out the Card Patterns blog. I used Elf Oliver on my card today. I colored him with Copic markers and added some shimmer to the edges of his hat and Santa suit with my clear Spica glitter pen (I wasn't able to pick up any of that in my photo, but it does sparkle in real life.. :)). The tatted snowflake was made by my cousin, Jessica. I've been hoarding this forever and finally decided to add it to a card. If you'd like to see more of her creations, please visit her Etsy shop! Accessories: Lacey Circle Nestabilities, Standard Circle Nestabilities (Spellbinders); Tatted snowflake (Snapdragon Lace Etsy), Divine Twine, Button (Papertrey Ink), Foam tape, Thread, Sewing machine. Super cute card! 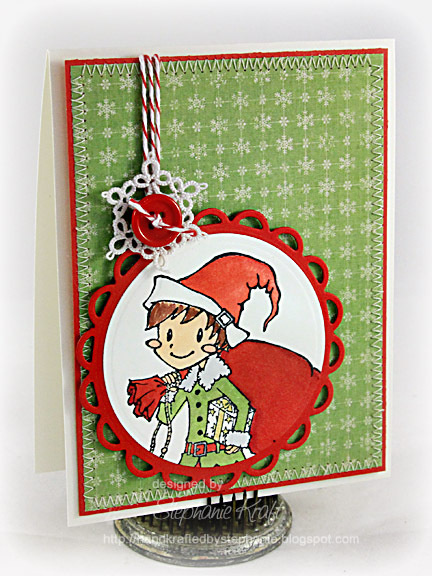 Love the little elf and the lacey doily! What a darling card! I love the traditional colors with this! This is AWESOME Steph! LOVE that snowflake and the bakers twine!!! Love the snowflake!! Cute card! Adorable image and love how you framed him out with the fun accent. Sooo very pretty...Love the cute iamge!